Sharon Alexander is a product of a Conservative Jewish education and has spent 25 years at the forefront of Jewish Renewal; as a community organizer, teacher, vocalist, and visionary. Sharon's professional path has been that of a spiritual midwife; using Body-Psychotherapy, Massage, and vocal, breath and energy work to encourage fellow travelers to both free and build their energy in order to ascend towards the divine. Says Sharon, "Singing IS my spiritual path; my way to open to God." 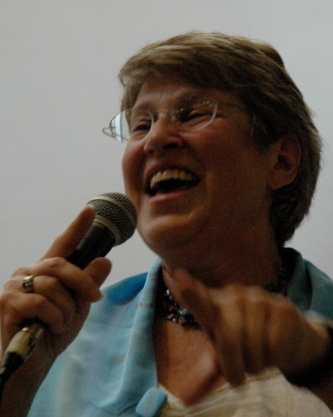 Her teachers include Susan Osborne and Ysaye Barnwell, Reb Shlomo Carlebach and Reb David Zeller, Sister Ruth Ward Heflin, Dr. Jim Oschman, and, most significantly, Rabbi Zalman Schachter-Shalomi, founder of the Jewish Renewal movement, who has granted her the title of Ba'alat Shirei Hama'alot B'chesed Elyon, leader of Sacred Chorales. She presently lives in Basel, Switzerland, where she leads services for Migvan, a new progressive Jewish congregation. Since 2003, she has been teaching her gospel material both in workshop and choir form. She has taught both at the Limmud Conference in England and the Aleph Kallah in the US, and has begun introducing this work at synagogue services as well. She is available to bring these unique and joyful teachings to your community too, at your next retreat or conference. She is presently a doctoral candidate in Ethnomusicology at the University of Bern, Switzerland.